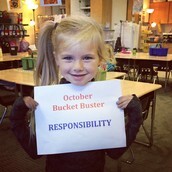 KT's character trait for October was Responsibility. 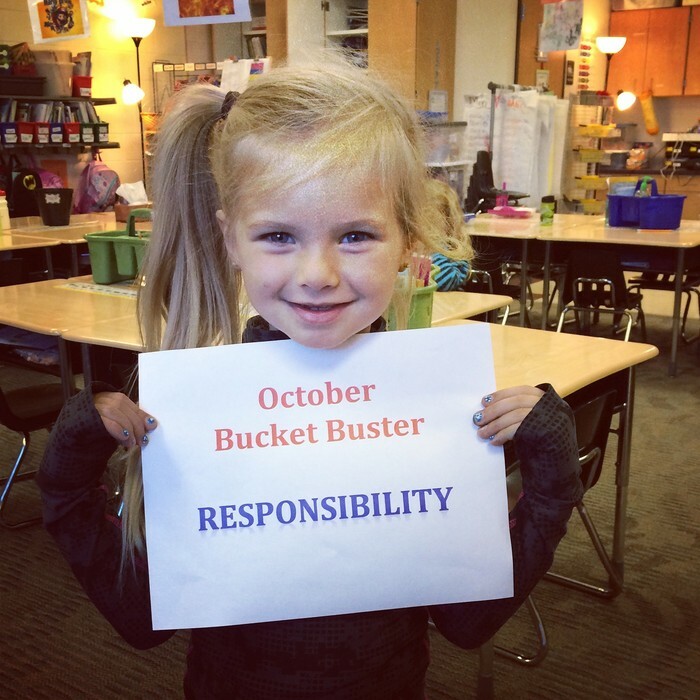 Our class bucket buster for the month was Aubrie! Contrats Aubrie for being caught being responsible all month! Please take some time to talk to your child about a new student starting Monday. Her name is Kylie. We will now have two Kylie's. A Kylie H. and a Kylie K. Kylie K. will start on Monday. I talked to the class briefly this afternoon about this. I know they will welcome her with open arms. Please keep in mind that makes our class number 24. If you have snack next week please make sure you send enough for 24. Thank you! Gifts from the Heart will be accepting requests for families needing help with toys this holiday season. Intakes will be accepted beginning in December, through Heart-n-Hand Ministries. Please contact our Family-School Liaison, LaShandra Shepard, at 348-1137 for more information. At conferences I did not communicate all of the testing requirements before they can move onto the next list. Color words I will just be quizzing the words and if they master all of them they move on to Quarter 2 word list. When they bring back quarter 2, 3, & 4 lists, I will quiz them on words as normal, BUT then they ALSO need to pass a test using the words in a sentence. The sentence will be made up of the popcorn words from the list and pictures to represent the words that are not known. For example, I like the dog. The word dog would have the word and picture to help them read that word. So when you are working on these words, take time to find them with in books you are reading or create sentences for them to practice. The main point here is that we want kids to be able to recognize them within text and not just in isolation. Please let me know if you have any questions! Thanks to everyone that offered to donate to our Thanksgiving Feast! We need a ton of red apples to make applesauce! The Tasting Feast is a ton of fun and we love for parents, grandparents, aunts, or uncles to join us. If you plan to join, please let me know! This is the most updated list I have. If you said sign you up for what I need. Please look before for where I placed your name. Bold and underline items are items I STILL NEED or need more of! Next week we are going to begin talking about the different components of writing – capitalization, spaces between words, add detail illustrations, and sentence starters. We will learn more about punctuation after we come back from Thanksgiving Break. In math we are working on comparing objects by their length and measuring different objects. We will begin to talk about the different weight of objects and use the balance scale to weigh various items. Tis the season for chapped and burning lips. I do not have anything I can give them. However, I am okay if they have their own chapstick (NOT lipstick or lip gloss) that is made to help chapped lips. Before they can bring it to school, it is a must that you talk to them about using it responsibly. 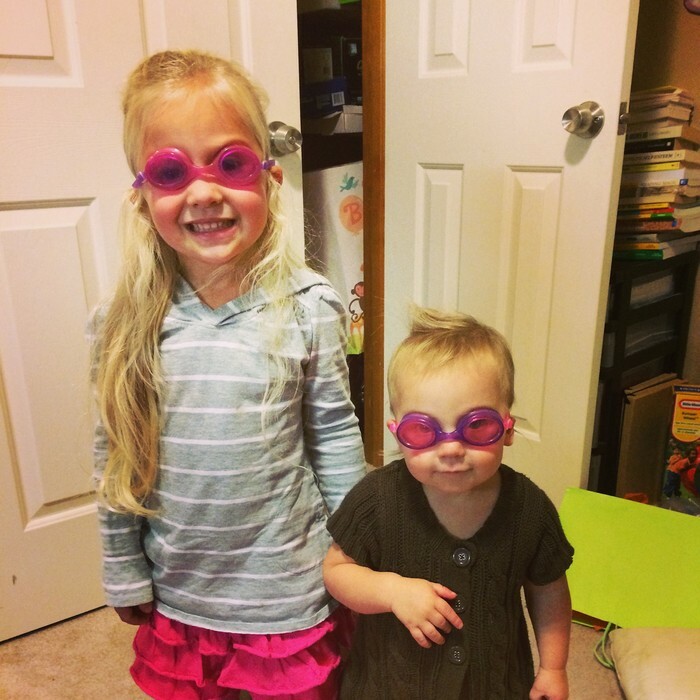 They need to keep it on their body or in their school box and they CANNOT share. Just like with any extra little thing that might come to school, I tell them if it is hurting/disrupting their learning or someone else’s, it will go in their back pack. Guess How Many Party Items – They will do this on Monday in the library when we go to make our wish list. The student in our class that is the closest to the right amount will win a poster. Non-Perishable Food Drive – Runs Monday, November 17th – Thursday, November 20th – Every can/box students bring in they will receive a ticket to put in a drawing to win a book or another fun item. - Grade level that brings the most food will receive $15 for each teach in the grade level to purchase books for their classroom. 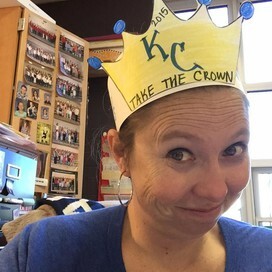 Hat days are Friday, for $1 students can wear a hat on Fridays. This month we will be donating hat money to Juvenile Diabetes. Let me know if you interested in being a mystery reader in our classroom. They love seeing the adults they know! I can be very flexible on the time and day.